One hundred and fifty years ago, home cooks and commercial food processors relied on brining (along with salting and smoking) to prevent meats, fish, and vegetables from spoiling. Today, brining is making a comeback. Brined chicken and pork dishes appear on upscale restaurant menus. Cooks are rediscovering that brining is a simple way of improving texture and flavor. Since brining causes meat to absorb liquid, a seasoned brining solution makes meat juicier and tastier than it would be otherwise, a godsend for ultra-lean American pork and even for turkey. My friend Nancy Oakes, chef-owner of the San Francisco restaurant Boulevard, gave me her recipe for brining, which I've adapted for this easy dish. I like to serve these pork chops with Versatile Buttermilk Mashed Potatoes and Fiery Garlicky Greens. If there are leftovers, cooked chops will keep for several days in the refrigerator. Their low fat content makes it too easy to dry them out during reheating, so I prefer to use them cold. Trim the meat off the bone, remove any fat remaining along the outer edge, and then slice the meat as thin as possible. Use in a sandwich or a salad, or as part of a cold meat plate, with Roasted Pear Chutney or Herbal Mayonnaise. (All these recipes mentioned can be found in the book). 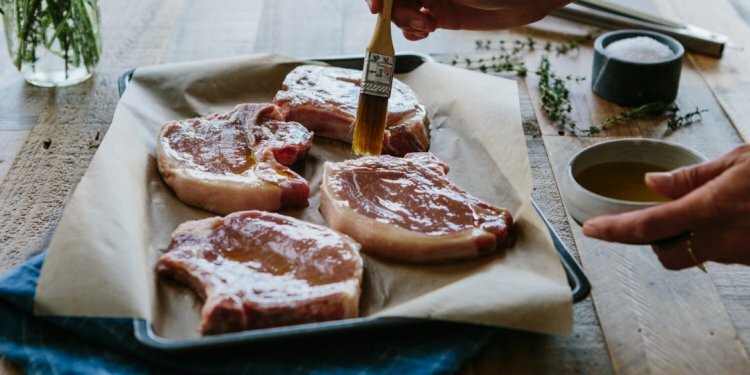 Twelve hours is the optimal time for brining the chops, so plan on making the brine and marinating the chops the night before you intend to grill them. Brining them for slightly less time is fine, but longer than 12 hours, and the chops will start to take on the texture and flavor of ham. Once brined, however, they can be refrigerated for several days before cooking.